I had fun playing last Sunday with Daniel Popsicle at an Alameda Street Fair, even if the audience was not quite sure what to make of this strange band playing “Music of El Ceritto”. The best part was a suite of three very short pieces with Dan singing his complaints about 1) his stupid cat; 2) the perpetual situation with the dishes and the kitchen, and 3) street fairs. There is a lot of complaining in this world, but not nearly enough complaining at street fairs. So, it was a good day. 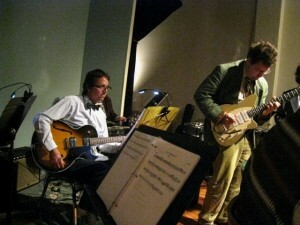 Below is a picture of myself and fellow Popsicle John Shiurba at the Subterranean Art House last month. We’ll be playing there again on Sep 21, with the great Dandelion Dance Theater Co.